For the next 10 days of Thanksgiving, Arps Dairy will share one Thanksgiving recipe a day that will help ensure that your Thanksgiving feast is a hit among the entire family. We will focus first on appetizers, then move to side dishes, the main course, and then desserts. We will start the appetizer section off with this great recipe which features one of Arps Dairy’s most popular products, our Country Style Cottage Cheese. If you are a lover of the texture and flavor of Arps Dairy’s Country Style Cottage Cheese, then you will love this Sweet Pea Crostini Thanksgiving appetizer! The peas give the dip a hint of sweetness, while the cottage cheese and feta make it perfectly creamy. Served on crunchy, chewy bread topped with salty bacon makes these the perfect appetizer for your Thanksgiving feast. The dip travels great, make ahead and assemble crostini upon your arrival. If sweet peas aren’t in season, sub frozen peas. In the bowl of a food processor, place about 3/4 of the feta cheese, Arps Dairy Country Style Cottage Cheese, blanched peas and next five ingredients. Blend until smooth. 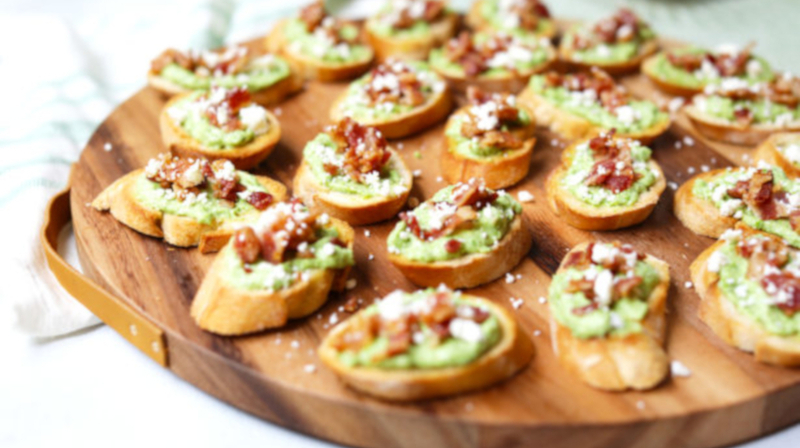 To serve, spread each crostini with sweet pea mixture, approximately one heaping tablespoon per slice. Top with bacon crumbles and sprinkle of feta cheese. Place crostini on serving platter. If making ahead of time, place in air tight container and refrigerate for up to 48 hours.